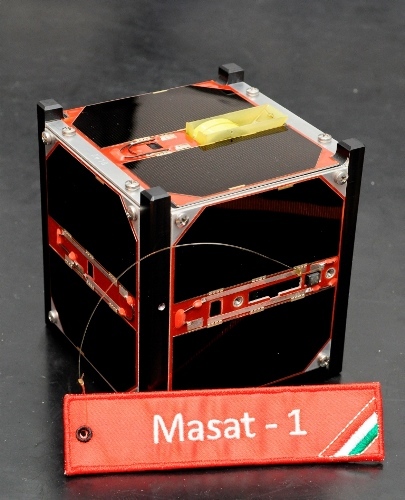 Today at 12:31 CET a satellite named MaSat-1 has catapulted Hungary at rank 47 on the list of space nations. The tiny space probe is as large as a milk container and weighs less than three pounds. The small Hungarian experimental satellite has been launched today at 11:00 CET (07:00 local) from the European Kourou spaceport, together with two large Italian satellites and another six CubeSat size mini probes. The name MaSat – which in spoken Hungarian means daubery – has been combined from the words Magyarország (Hungary), and satellite. It is a technology demonstrator without any further function and will orbit in 350 km altitude. MaSat has been launched with ESA’s new Vega launch vehicle that has been developed during the recent ten years and can launch satellites up to 3 tons into low Earth orbit. Currently, this launch class is performed by former ballistic missiles like the SS-19 Rockot or the SS-18 Dnepr. Vega is more than 30 meters tall and weighs over 130 tons, most of it being fuel, and will replace the former Soviet missiles in a few years. The new launcher’s maiden flight had a statistical 57% chance of a failure, but finally performed perfectly. Hungary’s space efforts have been encouraging after the end of the socialist era, but have starved since then of lack of political interest. First of the counties of the former eastern bloc cooperating with the European Space Agency ESA in 1992, negotiations failed frequently and came to an end five years ago. Its post communist neighbors Czech Republic and Romania have already been admitted to ESA; Poland and Estonia will be affiliated soon. Hungary’s indifference in developing its national space sector is a severe blow against its scientific institutes and its industry. Numerous scientific instruments and satellite equipment have been designed and manufactured in Hungary, such as the Pille radiation dosimeter on board the International Space Station ISS. But the country has no master plan of how to implement scientific and engineering know-how into a long-term strategy. Facing fatal political and financial problems, Hungary is not expected to change its attitude towards space on short-term. Joining ESA would require a kick-off contribution in the order of 10 Mio Euros, of which most of the money is immediately reinvested into national space projects. But the country is skint and currently begging for loans at the IMF and the EU, who in return demand fundamental political changes in recent legislation over the freedom of press, rule of law and the constitution. Finally, MaSat may become just a minor note in the book of space history. Space nations in alphabetical order: Algeria, Argentina, Australia, Brazil, Bulgaria, Canada, China, Colombia, Denmark, Ecuador, Egypt, France, Germany, Greece, India, Indonesia, Iran, Israel, Italy, Japan, Malaysia, Mexico, Nigeria, Norway, Pakistan, Poland, Russia, Saudi Arabia, Singapore, South Korea, Spain, Sweden, Switzerland Taiwan, Thailand, The Netherlands, Turkey, UK, Ukraine, USA, Venezuela, Viet Nam, plus three Asian joint undertakings MCSTA, RSAF and SCO and the European Space Agency ESA. 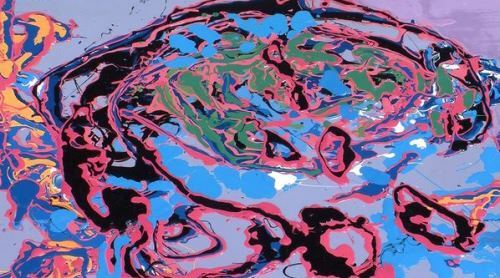 Commissioned exhibition for the Grenoble based European Synchrotron Research Facility is combining science and arts in a mobile piece of discovery hardware. I have drafted and designed the exhibition hardware and managed the project. Details HERE. German dead satellite Rosat de-orbited today early towards four o’clock EU time, almost a day earlier than previously expected. According to US military information, the satellite’s impact site is estimated just off the coast of Myanmar in the Bengal Sea, following a long entry pass above the Atlantic and the Indian Ocean. No damage has been reported so far, and it is still unclear, if any parts of the satellite have reached the Earth’ surface at all. The German space observatory Rosat has been launched in 1990 and was a breakthrough in X-Ray astronomy. 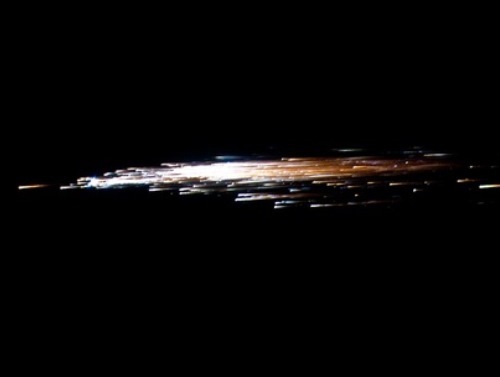 Since it became uncontrollable 1999, the re-entry was just a question of time. Earth’s gravitation pulls every object in space down, while the Sun pushes them towards our planet. Rosat is one of first large objects smashing down from space, while Hundreds of Thousand pieces of space debris are still on the waiting list for the next century. It’s great to sit in a real spacecraft – of course with the proper dress code. 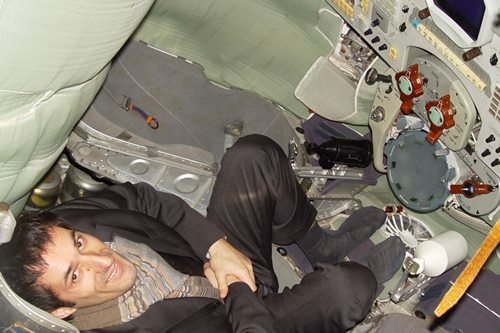 When I was negotiating with Russian Space giant Roscosmos in 2004, they invited me to their space training facilities near Moscow, and allowed me to test seat in a Soyuz capsule. A remarkable day with remarkably friendly people all around – including record breaking cosmonaut Sergei Krikaljov and Juri Usatchov. And of course me, coming home with a multi-million Euro space exhibition that turned out to be the most successful ever in Germany. In the morning of 7. 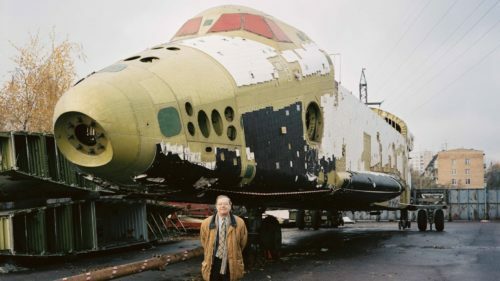 April 2005, I found myself at the outskirts of Moscow – together with aerospace engineer Vladimir Fishelovich, where he introduced me to one of the five pieces of hardware ever built for the Soviet Space shuttle programme. In fact, we were standing next to a Buran Space vehicle. What an amazing moment! Later, this spaceship was sold to a museum, since the Buran programme has been abandonned by the Russian authorities ten years earlier.